WASHINGTON -- A former Obama administration official takes potshots in his new book at House Majority Leader Steny Hoyer, a fellow Democrat who led congressional efforts to reinstate dealerships terminated by General Motors and Chrysler. Steven Rattner, who headed the administration’s auto task force that shepherded GM and Chrysler through bankruptcy, also takes aim at dealers Jack Fitzgerald and Tamara Darvish. The Maryland dealers are two of the three leaders of the Committee to Restore Dealer Rights, a group of rejected GM and Chrysler dealers that joined forces with Hoyer to help get a dealer-arbitration law enacted last year. 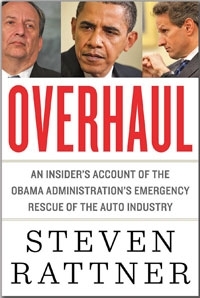 “When Congress did try to intervene, as with auto dealer closures, the result was an enormous, pointless distraction for the two companies at a critical time,” says Rattner in his book, Overhaul: An Insider's Account of the Obama Administration's Emergency Rescue of the Auto Industry. The book went on sale Monday. Following numerous meetings with Fitzgerald and Darvish last year, Hoyer teamed up with Rep. Chris Van Hollen, D-Md., to draft and steer the dealer-arbitration bill through the House. It was passed by the Senate a few days later and signed by President Obama in December. Rattner expresses particular pique with Hoyer, whose district is in Maryland, for lobbying him on Fitzgerald’s and Darvish’s behalf. “I was mystified that the House majority leader chose to devote so much time to this,” Rattner writes. Hoyer, the No. 2 Democrat in the House, “wasted so much time browbeating the task force about a couple of Maryland car dealers,” he says. A Hoyer spokeswoman defended the lawmaker’s actions. He “worked hard to ensure that there was a fair process in place, which was needed after dealers were closed and tens of thousands of jobs were cut amid serious questions about the true economic benefit,” Hoyer spokeswoman Katie Grant said. She cited a July report by an independent government auditor that faulted the auto task force for seeking dealer cuts at a time of economic hardship and without rigorous analysis of their impact on the automakers. During arbitration, GM reversed course on more than 700 of the 2,000 dealerships targeted for closure during its bankruptcy proceeding last year. These stores were offered letters of intent by the company after Ed Whitacre became CEO. Chrysler stood by its decision to close 789 stores during bankruptcy and battled dealers in arbitration. Only 29 of these shuttered stores are on track for reinstatement. Darvish had two Chrysler stores closed and one GM dealership targeted for elimination. Her GM store was reinstated by the company. “I’m not sure if it’s out of ignorance or arrogance that the car czar, knowing nothing about our industry and significance to our economy, made decisions that he made based on self-created theory,” she said. Fitzgerald had five Chrysler stores closed and two GM dealerships marked for termination. He won one arbitration with Chrysler and lost four. Both his GM stores were reinstated. Fitzgerald, like Hoyer, cited the government audit last summer that sharply criticized the auto task force’s approach.